The legendary music group, Earth, Wind & Fire will perform at the Vina Robles Amphitheatre on September 17. Earth, Wind & Fire are a music institution. Over their five-decade history they've sold out concerts all around the globe, scored eight number one hits and have sold over 100 million albums worldwide. They have since released 23 albums, eight of which have gone Double Platinum and hit the Top 10, making them one of the best-selling artist of all time. They have also won an impressive nine Grammy Awards, including one for Lifetime Achievement (2012). In 2000, Earth, Wind & Fire was inducted into the Rock and Roll Hall of Fame, cementing their lasting impact on popular music. Celebrating timeless songs and a commitment to spreading positivity, Earth, Wind & Fire has consistently made music that has bridged the gap among all generations and nationalities. With a sound that blends funk, jazz, pop, soul and R&B, Earth, Wind & Fire launched a musical genre that can't be confined to a specific label except their own. Whether it’s the funky and infectious “Let’s Groove” to the timeless dance classic “September” to the heartfelt “Reasons,” Earth, Wind & Fire’s catalog of hits has become the soundtrack many lives; now, then and forever. 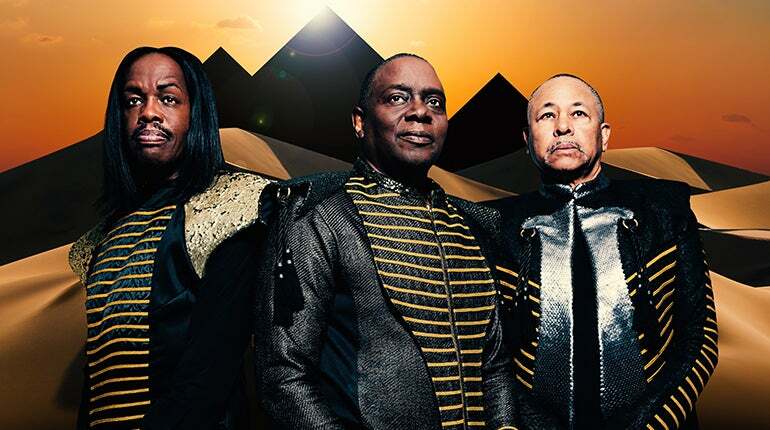 The music of Earth, Wind & Fire is more alive than ever as they continue to inspire new audiences and thrill those who have been with them from the beginning. Like the elements in their name, Earth, Wind & Fire’s music has withstood ever-changing trends in the world and shows no sign of vanishing and they continue to create joy and uplifting music that will forever reach a sacred universal atmosphere.